Irv Epstein is fascinated with patterns — how they show up in economics, in the coats of animals and within social systems. While his research is done in the lab, it is proving that chemical reactions and mathematical formulas may also be used to understand how organisms move and the way animal populations survive in the natural world. Epstein’s group studies oscillatory chemical reactions (systems in which concentrations of various chemical increase and decrease over time); cross-diffusion, spatial pattern formation, transformation of chemical into mechanical energy, dynamical systems and neurobiology. He is the former dean of arts and sciences and provost at Brandeis. He’s also a founder of the Science Posse, which brings underrepresented and economically disadvantaged students to Brandeis to study science. 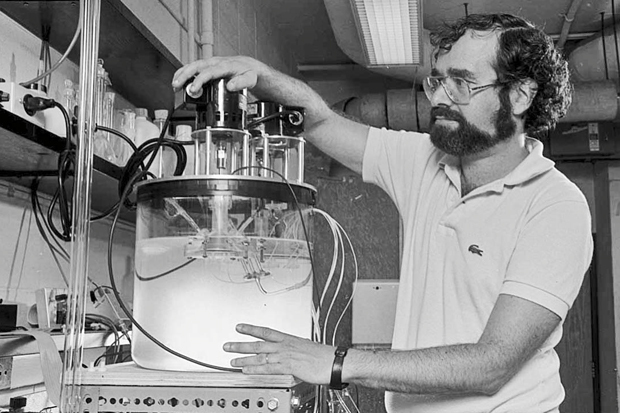 Hired in 1971 to teach quantum mechanics, Epstein says his interest in oscillating reactions came about while working with some eager undergraduates who were looking for a summer project. Feeling that quantum mechanics would be a bit too complex for students who had just finished their freshman year, he recalled an article in the Journal of Chemical Education about oscillating chemical reactions and suggested the topic. Little did he know the project would reroute his career. Epstein says non-linear dynamics and exotic reactions like oscillating chemical reactions are quite rare in chemistry but very important in biology, because every living system is full of reactions in which concentrations increase and decrease, typically on a daily cycle. Unraveling this phenomenon in chemistry is offering insights into pattern formation in other systems, such as human and animal populations. To better understand diffusion, cross-diffusion and oscillatory chemical reactions, Epstein revisits a science demo popular with the elementary school set: The glass of water and drop of food coloring. Diffusion is the phenomenon by which a species spreads out from a concentrated region to a less concentrated region. When a drop of red food coloring is placed in a glass of water, the food coloring disperses over time, resulting in a uniform pink glass of colored water. The process by which the color spreads is diffusion. Cross-diffusion is a process in which two species are spreading- for example, if you have both a red drop and a blue drop of food coloring; the “cross” aspect means that the distribution of one color affects the diffusion of the other. Using his theories, Epstein is creating mathematical models to use in the context of biological, ecological and social systems. While he’s not expecting urban planners to track him down this year, his research is gaining momentum. In ecology, Epstein says, one can create models to describe a predator-prey system. While many of the exotic reactions that Epstein examines touch on oscillation and transience, Epstein himself is an example of steadfastness. —Irv Epstein, a founder of the Science Posse, which brings underrepresented and economically disadvantaged students to Brandeis to study science. Epstein has spent this year at Harvard as Radcliffe Institute Fellow, but he has literally spent his adult life at Brandeis. He arrived in 1971 during the bitter end of the Vietnam War, experienced the ‘80s with the explosion of the space shuttle Challenger and the discovery of AIDS, the ‘90s with the release of Nelson Mandela, the end of the Cold War and the dawn of the 21st century, where smart phones and social media have changed the way people live their lives. As Epstein points out, the lab facilities at Brandeis have evolved as well. A native of Queens, N.Y., Epstein was an only child. His father was a locksmith born in Russia, his mother a school librarian. He earned a B.A. in chemistry and physics, an M.A. in chemistry and a Ph.D. in chemical physics from Harvard University and a diploma in advanced mathematics as a Marshall Scholar at the University of Oxford. After a NATO post-doctoral fellowship at the University of Cambridge, he moved from England to New England, accepting a position at Brandeis. Twenty-one years later, Epstein was made dean of arts and sciences, moving up to provost in 1994 when the incumbent provost, Jehuda Reinharz, became Brandeis’ seventh president. Robin Feuer Miller, professor of Russian literature who served as dean of arts and sciences from 1994-2000, worked closely with Epstein during his seven- year term as provost. “He is, quite simply, one of the smartest people I know,” says Miller. “But what I perhaps valued most about working with him was his ability to change his mind” after making an effort to understand another side. On the occasions when they disagreed, Miller said, they were always able to talk things through and come to an amicable decision. Perhaps it’s this passion for people and progress that played into Epstein’s success in garnering a million-dollar grant in 2006 from the Howard Hughes Medical Institute (HHMI), the nation’s largest private funder of science education, to start the first Science Posse, a program at Brandeis created to attract and retain talented, underrepresented students in college-level science. In 2010, the foundation awarded an additional $600,000 to further develop the program. The Science Posse is an extension of the successful Posse Foundation, a liberal arts program founded in 1989 by Brandeis alum Deborah Bial ‘87, which carefully selects and trains a group or “posse” of students who act as a support system for each other. Though the students don’t know each other when they’re chosen, between the time that they’re selected in December and when they arrive on campus in September, they will have spent 3-4 hours a week together, bonding and learning skills from time management to persuasive writing. Jerry Saunders II ‘11 is a member of the Science Posse. He said that working in Epstein’s lab was one of the highlights of his undergraduate career. Eve Marder, head of division of science and the Victor and Gwendolyn Beinfield Professor of Neuroscience, got to know Epstein in the late 1980s when the pair collaborated on building a semi-realistic model of a neuro-oscilator; in other words, they developed mathematical models used to research several kinds of neurons that are studied in Marder’s lab. “He was doing the theory and we went back and forth discussing the biology,” says Marder. The two also wrote a grant together.